Pattaya Klang Center Point Condominium is situated on a prime downtown 3 Rai/4,800 Square Meter plot of land which is situated a stones throw away from the main arterial roads of Pattaya Klang and Pattaya 3rd Road. The project is comprised of 230 units of varying sizes and types to suit all budgets ranging from entry level 47 square meter studios to 59 square meter, corner studio apartments and finally culminating in massive 113 square meter, 2 bedroom units spread across a single, 21 story high rise building. Pattaya Klang Center Point Condo or simply PKCP Condo was completed back in 2009 by the Ratanakorn Asset Co.,Ltd whose a locally based Thai owned development company. In actuality PKCP Condo forms part of a greater complex made up of 2 other condominium projects namely, “Pattaya Center Point” and “Pattaya Euro” both of which are 7-story, single buildings together with several commercial shophouses. The project features 2 primary entrances, 1 being by way of Pattaya 3rd Road and the other 1 being by way of Soi Paniadchang, which is right next to “Big C Extra” and the main baht bus route alongside Pattaya Klang which is only a few minutes walk away. The project features both a large communal swimming pool and fully-equipped gymnasium together with more traditional amenities such as a ground floor lobby entrance and reception area, 2 high-speed passenger lifts, under-ground car-parking and 24 Hour security. Ground floor swimming pool and sundeck surrounded by high walls for added privacy. Ground floor hotel-like lobby, lounge and reception area with elevated ceilings and decorative drop down lighting. Finished bathroom(s) with grey granite sink counter-top(s), white porcelain oval sink(s) and vanity mirror(s) together with a bath and shower. Pre-installed hot water heater with an adjustable dial in every bathroom. Private balconies with an aluminum balustrade for optimal city and/or partial sea views (depending on floor). Slim-line air-conditioner(s) being 1 in a studio, 2 in a 1 bedroom and 3 in a 2 bedroom apartment with the compressor(s) being mounted off to the side on the balcony. 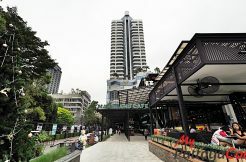 Pattaya Klang Center Point (PKCP) Condo was completed in 2009. No. of Floors: 21 Floors, 1 Building. No. of Units: 230 Units. Maintenance Fee: 24THB Per Square Meter Per Month (Ongoing) Payable 1 Year in Advance.